When you buy a Bongo, it will either be an MPV with a lifting Auto Free Top, come with a factory fitted kitchen or be already converted by a Bongo campervan conversion company. 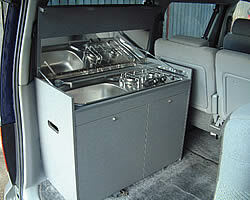 Many companies offer conversion services to convert your Mazda Bongo or Ford Freda to a fully fledged campervan. DIY conversions are also popular with some companies offering courses to show you how to do it. No items matching the keyword phrase "mazda bongo conversion" were found. This could be due to the keyword phrase used, or could mean your server is unable to communicate with Ebays RSS2 Server. A moulded permanent conversion fitted at the Mazda factory. The conversion will be the same age as the vehicle rather tahn an older Bongo with a new conversion. The conversion is moulded into the interior. Converting your Bongo into a campervan couldn't be easier if you have the right kind of budget. Even if you don't, consider buying it in kit form. There are many companies offering new conversions for Bongos. They all offer different styles and layouts. Buying an already converted Bongo should be seriously considered as it could save time and money. Ideally suited for the occasional campers who still want to use the Bongo as an MPV with 8 seats. To fit the part conversion, you simply remove one rear split seat and bolt the portable unit in place. You then have a 4 berth camper which can easily be converted back into an 8 seater MPV. These are easiest for earlier Mazda Bongos (1995-96) as they already have the rear split seat. Shown to the left is a part conversion designed by Bongo campervan conversion specialists AVA Lesiure. These are usually side conversions where the Bongo is permanently converted into a campervan. 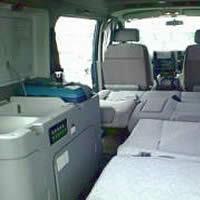 There are options for a 6 seater full conversion but a 4 seater full conversion is more common. A full conversion usually inludes a sink, fridge and burner complete with a dining table. 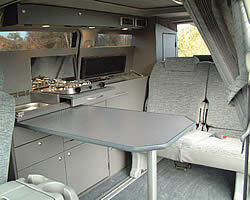 Some conversions use a rock-and-roll bed while others retain modified original seats. Shown to the left is a full conversion designed by Bongo campervan conversion specialists AVA Lesiure. Another option for getting a sink, fridge and burner permanently into your Bongo is to have a rear conversion for your Bongo. 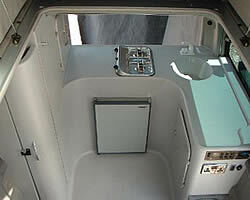 One of the draw backs of a rear conversion is that you are more reliant on the Bongo's side door for access. Some rear conversions allow for four berths in your Bongo while some larger rear conversions only leave space for sleeping above. With a wide variety of different designs, you should find something to suit. 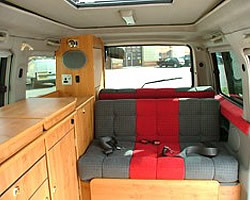 Taking a Mazda Bongo MPV and converting in to a campervan is a real possibility if you have the necessary practical DIY skills such as woodworking, electrics, decorating etc. Most of the information you'll need is readily available on the internet. This video is useful to give you a feel of what might be required. You may also want a leisure battery to run your lighting and fridge and mains hook-up for use on campsites.